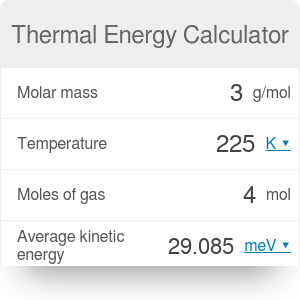 Our thermal energy calculator is a handy tool which can characterize ideal gas parameters, such as the average kinetic energy of molecules, the average velocity of molecules or the total thermal energy of the gas. The behavior of gases can be explained by the kinetic molecular theory, which describes a gas as a large number of atoms or molecules which are in constant motion. Those particles can collide with each other and with the walls of the container. Read on if you want to know more about kinetic molecular theory definition and find out what is the relationship between temperature and kinetic energy. In the text below, we have explained what is thermal energy, as well as provided the thermal energy definition and thermal energy equation. You may also be interested in our air pressure at altitude calculator or air density calculator. A gas consists of particles of the same mass and negligible size compared to the average distance between particles. Particles are in constant, chaotic motion. Interactions among molecules are negligible, except during collisions between particles which are perfectly elastic. Check our conservation of momentum calculator to learn about different types of collisions. The average kinetic energy of the gas particles depends only on the temperature of the gas. Time of collision is very short compared to the time between collisions. These assumptions are approximately met for gases at not too high pressures and not too low temperatures. Thermal energy is the internal kinetic energy which arises due to the random motion of molecules. Each molecule has a different velocity (that changes after collisions) which can be described by the Maxwell-Boltzmann distribution. We have written more about it in our particles velocity calculator, where you can also compute the average velocity of the particles at a specific temperature. The total thermal energy of a gas is given by the sum of kinetic energies of all of the particles. You should remember that it is a mistake to equate thermal energy with heat. Heat, like work, is a way to transfer energy. And if we want to answer the question of what is thermal energy, we can say that it is an internal property of a system. Na is the Avogadro constant Na = 6.022140857 * 10^23 1/mol. The number of degrees of freedom is a physical parameter which is necessary to characterize the state of a physical system. In our thermal energy calculator we assumed that it equals 3, which is true for a monoatomic gas. If you want to change it, go to the advanced mode. Do you want to estimate other parameters of an ideal gas? Check our ideal gas law calculator to find out what is the relation between temperature, pressure, and volume of gas. Thermal Energy Calculator can be embedded on your website to enrich the content you wrote and make it easier for your visitors to understand your message.